Being a cat owner, you surely would have been through a situation when you are off to bed and all set to get some z’s and your feline bounces off upon you on the bed in a mood to take down the entire house. Well, get your feline a cat bed, will you? According to many of the animal experts, there actually is a biological reason that justifies this behavior of our dear cats. The most common reason for this could be the fact that the place where she sleeps is uncomfortable. Cats sleep for almost 16 hours a day. If this is taken into consideration we will realize how much time they spend at the place where they sleep. So it is important that we make them perfect arrangements so as to help them get sound sleep and rest. After getting a pet cat we keep her as our own child. We try and fulfill all of her requirements. But many times we miss out on providing a perfect bed that would help our cats get a purr-fect sleep. Let us begin with the in-depth Cat Bed Reviews now! What is the Best Cat Bed? How to Choose One! Choosing a bed for our feline friend is a pretty difficult task to handle on our own. It is so fortunate for the cat owners that this issue has been taken seriously into consideration. 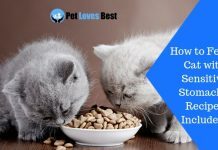 Here are the top 3 picks that are best on their own terms and that have helped soo many felines get sound sleep. OrthoComfort from Best Friends by Sheri is the perfect combination of comfort, coziness, and craftsmanship. It provides your kitty with a snug place to sleep in and adds to your home decor through its dashing looks. With generously filled bolsters all around, this is the absolute place for your cat or kittens to snug in, making it the best cat bed. And it is easy to wash directly in the washer. What else do you need?! Everyone knows that cats love to burrow themselves in cave-like places. They need to hide once in a while from the hectic world. And that’s when Petmaker Igloo super cheap cat bed comes into the picture. First of all, this cat bed is overloaded with cuteness. The foam filling along with soft material gives felines an ideal place to sleep. Moreover, it enhances the sense of security and privacy with its unique shape, making it your cat’s favorite snoozing place. Meowfia Premium Cat Bed is made from 100% merino wool and is handcrafted. It comes in a variety of choices and adds to your home decor like no other cat bed. 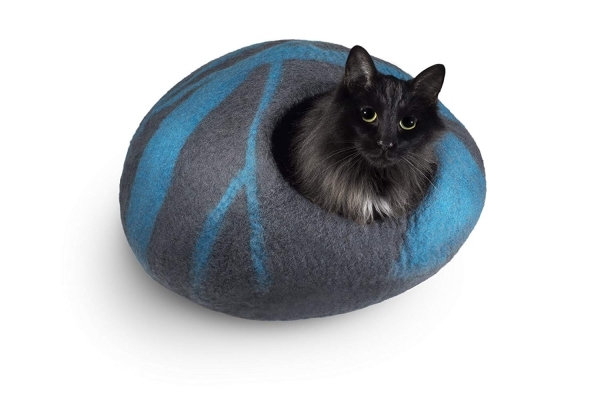 Moreover, this cave cat bed has become the favorite among the cat community as cats immediately fall in love with it. There is plenty of room and it can accommodate two kitties easily. The bed is made from 100% natural ingredients and the worthy brand offers a money-back guarantee if your cat doesn’t like it – which is an unlikely thing! Also, there have been a number of designers from around the corner who have taken steps in this context. Cat beds have become one of the most trending topics among the pet owners and also animal experts. Many experts have come together and have formulated different kinds of bed for cats with different lifestyles and breeds. You have a wide range of variety lying ahead of you to choose from. You get to choose from so many shapes, sizes, color, and most importantly the style that suits your cat friend the most. 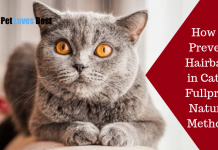 So, after some deep research here I present my top 10 picks for the best cat bed that are available in the market, along with a guide that would help you decide. 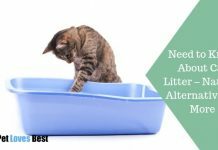 There are a few of the factors you would want to consider so as to choose which bed suits your feline friend the best. It is all amusing and fun becoming a cat owner. But it surely has struggle parts of its own that come along with it. They have to choose a variety of things that would make their pet cat live a happy and comfortable life. And most of the times the cat bed is the most neglected or forgotten part. It is important that you make comfortable arrangements for your feline friends as they spend most of their time sleeping. Thanks to all of the animal experts out there who have done lots of research in this field and as a result this market have shown tremendous growth in the last few years. Nowadays, you have so many choices to choose from and make a decision that suits your feline the best. So, it might get difficult for all of you out there so as to choose a decent one. So, here I present the top 10 types of cat bed you get to choose from. Hammock Beds, also known as Radiator Beds due to the fact that they could be attached to crates and hung over radiators. These come with metal hooks and straps which are adjustable included in it. These have four metal straps that make it durable. These beds are mainly ideal for small cats. These are of the type that provides your pet cat that warmth and comfort that she requires. Also, hammock beds provide that guarantee that ensures the safety of your furry friend. Hammock beds come with metal hooks that allow it to hold weights up to 6 kilos making it convenient for your pet’s safety. Moreover, these beds have a feature that supports the washing of the bed pretty easily. You just have to remove the metal hooks attached to it, and it would be so convenient for you cleaning the bed. Pillow Cat Beds are mainly designed for cats that much in larger sizes belonging to large breeds. These types of felines require an ample amount of space which could not be made available in closed beds. So, it is important for them that they get that enough open space which allows their large sized body to fit in. Pillow Beds are basically a large sized pillow that is made so as to fit the cats from large breeds. These beds also help the felines that are much likely to stretch out their limbs, which could prove to be an issue in closed bed. These beds come in a mouth-watering donut shape and so they are named as Donut Beds. Donut Beds are round in shape and come with a flat surface which is of cushion. Every feline loves this type of beds as these are raised from the sides. Donut Cat Beds are mainly designed for the cats who love to curl up while taking a nap. These beds cover an almost entire surface area and support the cat’s body, head, neck and also the back. It is mainly ideal for cats of small breeds. As they can easily fit in and take a cozy sleep. Igloo Cat Beds are one of the most chosen types of beds among the cat owners. Most of the cats crave for that cave-like structure for their beds. And, Igloo Cat Bed is one of the most comfortable types of beds that are available. Igloo Cat Beds have a soft and durable construction. These beds come with foam construction, as a result, these are able to hold their shape despite the fact they are so flexible. These beds are comforting enough for pets to get peaceful sleep during the night that enables them to stay active during the daytime. Also making it convenient enough for you to handle, Igloo Cat Beds are made so lightweight and also have a roof handle that reduces your effort to move the bed from place to place. Just make sure your pet doesn’t sit inside while you carry it around shifting to other room or anywhere else. Basket Cat Beds are the type of beds with a shape of a basket having fleece pillow for the support of the cat. These generally are round in shape having an open design that makes it more comfortable for the felines to lay in them. These beds are usually made up of paper ropes, so it is made for the cats of less weight. Basket Cat Beds are not suitable for the cats above certain weight as in won’t be able to carry their weights. These beds mostly come with defined sizes and mostly fit in small kitties in them. 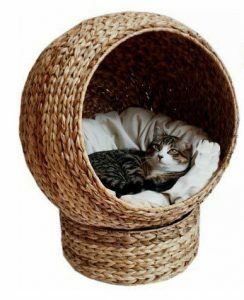 Basket Cat Beds are very cozy and help cats relax which love to curl up. Your kitties would love being curled up in these beds. Cave Cat Beds generally are made up of some soft waterproof material like velvet. You get different designs to choose from. These beds have ultra thick walls which are polyfill that ensures total comfort of your felines. Moreover, it has a base that is non-skid, that prevents it from sliding around. Cave Cat Bed is the best available option for the felines that love to snuggle. If this is the case with your feline it is the best product that I could recommend. Also, it is completely machine washable bed, which adds extra points to it. Foldable Cat Beds are 2 in 1 types of the pet bed. Foldable Bed could be used as a cozy hideout for your felines in the chilled winters. You can convert these beds to cozy caves that would provide them that protection against the chilly breeze inside the sturdy caves. Or else in the summers, you can choose to open the mat and enjoy laying in it comfortably. In both the cases, your furball is gonna be enjoying her bed and feel cozy using it. These kinds of beds are made up of high-quality material, having very soft material on the inside making it comfortable for the cats. And the outside is made up of materials that make it fit inside. Furry Cat Bed is a type of bed having a furry mat that easily convertible into a bed. It is made up of plus faux that makes it a comfortable type of bed your feline would love to sleep on. It can be convertible depending upon the space that you require for your feline according to her comfort. From the owner’s point of view, Furry Cat Bed would prove to be a great choice to make for your feline. These beds are machine washable which makes it pretty easy in terms of maintenance. Also, the form in which it comes in and is of the type that would suit the modern decor and get along with it. Self-Warming Beds are a boon for the cats that stay in a rather cold area. The upper part of the bed is made up of soft faux sherpa that keeps the surface warm and makes the felines feel cozy. And the base part is made slid-proof that prevents it from sliding on its own. Self-Warming Beds uses the technology of self-reflecting that was used in the space blankets. The inner layer of the bed is made of the material that takes in the heat generated by the pet’s own body and reflects it back, thereby making the inside warm. These beds do not use electricity to generate the warmth which keeps our dear pets away from any mishaps. More Cat Beds that can Keep Your Kitty Warm? Check out our Best Heated Cat Bed Reviews! Window Mounted Cat Beds are mainly for the cats that love high places as most of the felines do. These beds have such a design that will surely thrill your felines and excite them. These can be placed in any window of your house at any height. You just have to ensure that the window has no cracks in it. Window Mounted Cat Bed from Kitty Cot using suction cups that have patented to mount the hammock to the window. Also, it comes with a design that is so simple that allows anyone to put it up. Moreover, it requires the use of no tools for the process of installation. It is made up of tough fabric that weather resistant and the material is pretty easy to wash which is a much-required thing in the pet bed. It is always an important task so as choose a bed for our dear felines. Choosing a bed for our feline friends is a crucial step for them as it directly affects their health. So, it is always advisable to do thorough research according to the requirement and the lifestyle of our pet cats. Here are my top 10 picks for Best Cat Bed which I am going to review. I hope my reviews will help you choose the best pet bed for your cat. OrthoComfort from Best Friends by Sheri is a cat bed designed to provide the perfect comfort to your kitty. 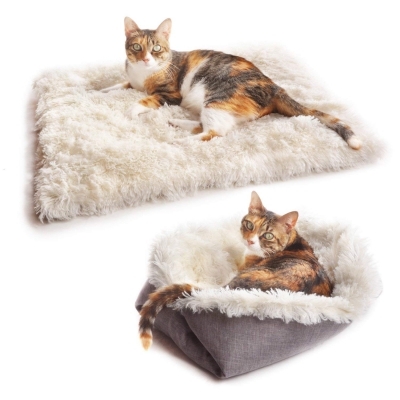 This brilliant cat bed comes with generously filled walls and a soft surface to lie on, with the perfect combination of comfort, coziness, and craftsmanship, this is without a doubt the best cat bed on the market. Starting with the sidewall-build – it is made with 9-inch thick filling that supports your pet’s body. 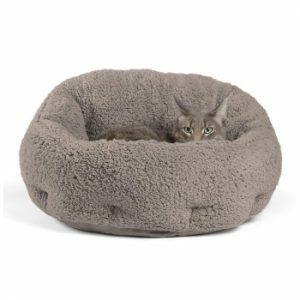 It has been seen that cats and other pets love to burrow themselves in some surroundings, which provides them with a sense of security and that is exactly what this cat bed does. Three of the sides are equal in height and the fourth one is a little high and tougher to provide extra support to the pet’s body. The seams are stitched such a way that there is a deep space for the cat to snug herself in. Moreover, besides coming with a supportive bolster-like surface, this cat bed is totally adjustable and stretches along with your pet’s body. So no matter what position your kitty likes to sleep in, this cat bed will totally adapt to her sleeping style without forcing the cat to adjust herself. Moving on, the plush upper surface of this bed will make your cat fall in love with it the same as thousands of other happy kitties whose parents purchased this product and expressed a 100% satisfaction. Though being plush from the above, it is waterproof nylon at the bottom. This is to ensure that no unwanted water spills or moisture are absorbed from the bottom of the bed providing the utmost dry and snug bed for your kitty to sleep in. Another great feature of this feline bed is that it is self-warming. Bed comes with a design that promotes snuggly sleeping and hence traps the warmth inside keeping your kitty cozy all the time. The kitty bed is sufficient to accommodate cats or dogs weighing up to 25 lbs, therefore, it can easily fit most cats and kittens. Talking about kittens, this is the best kitten bed as well! It has enough space for kittens to have a good night sleep. Also, it is self-warming and protects the newborn kittens from cold along with providing a sense of security through the sidewalls. Lastly, this cat bed is machine washable and can be washed easily right at your home. You do not need to disassemble anything, just pick up the bed and throw it in the machine and you’re done, it’s that easy! Therefore, the problem of odor, dirt, and shredded fur is no longer a problem. Made with premium quality materials. Superior cozy and soft plush sleeping surface. Deep seams to snug in. Comes with a self-warming design. The bottom is waterproof to keep moisture and dirt away. Thick 9+12” bolsters to support a cat’s body. Adapts to the cat’s body. Can be washed easily in the machine. Therefore, easy to maintain and long-lasting. Made with great craftsmanship and durable materials. Can accommodate pets weighing up to 25 lbs. Great feedback from the pet community. Aesthetic looks – available in tons of color choices to match your home decor. May not retain the shape for a longer period as it adapts to the pet’s sleeping position. MEOWFIA Premium Cat Bed is one of the most desirable cave cat bed on our review due to its sheer elegance and quality craftsmanship. The product is entirely made from merino wool by hands! And therefore, it is 100% natural without a single chemical compound used. The type of this product would be a cat cave bed. It can both be used as a cave bed that your cat can burrow itself within and as a simple cat bed that your cat can lie upon. In simple words, it is convertible and can be used as per your cat’s mood. If she needs to be isolated from this mundane world, she can use it as a cave to burrow and have some privacy and if not she can always lie on top of it. Further, the most amazing thing about this cat cave bed is its craftsmanship. It has been crafted by hands and looks utterly beautiful. In fact, these beds look even prettier than they seem in the pictures. And with an adorable cat inside, it will be a sight with cuteness overloaded. The size of this cave bed is quite roomy. It can easily accommodate a cat weighing up to 20 lbs. Therefore, if you have medium-sized cats, you can buy a single cat bed for multiple cats as well. We’re sure that both cats will be more than happy to share this lovely cat bed. The cat bed comes in 4 attractive colors. Although each color is striking itself, you should choose the one that compliments your home decor. Yes, this cat burrowing bed is so stylish that you can even use it as a part of your home decor, unlike those eyesores of products out there on the market. Made with 100% natural materials – merino wool. Amazing craftsmanship – looks even better than the pictures. Available in multiple colors to add to your home decor. Trusted and reviewed 5 starts by thousands of cat parents. Convertible – can work as both a cave bed and a simple bed. 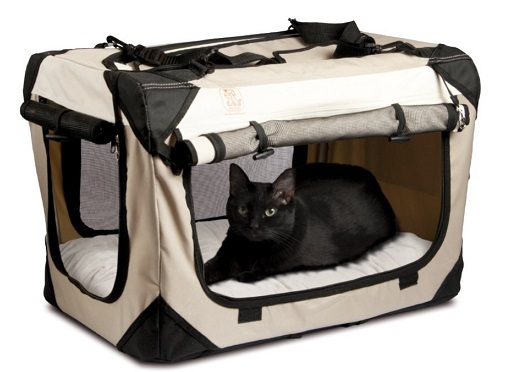 Has a large capacity to accommodate multiple cats inside – 20 lbs. Great after sales service from the brand – money back guarantee. You’ll have to add a comfortable blanket inside to ensure coziness of your kitty. Has a mild woolen smell for the first couple of weeks. MEOWFIA Cave Cat Bed is a premium product made with quality material and a superior finish that adds to your home decor. Therefore, it obviously comes with a premium price tag. In order to purchase this beautiful cat bed, you will have to spend almost twice as much as a normal cat bed. However, it is definitely worth it, in our opinion as well as according to thousands of happy kitty owners around the globe. So what are you waiting for? Go get your cat a comfy and cozy cave bed, will ya?! If you have a cat craves for a cave-like structure or loves to cover herself while she’s asleep this is the product you should be going for. Igloo Cat Beds are the type of closed cave structure that is loved by most of the pets. Felines require twice as much sleep as we humans do. So, it becomes our duty so as to ensure they get comfort sleep by providing them with beds that they require. Petmaker Igloo makes is a pleasant experience for the kitties to relax indoors. Its soft fabric makes it warm inside and provides complete comfort for your felines thereby helping them get a deep sleep. The best thing about this Cat Bed is its design. It is designed keeping in mind the likes of kitties. It has a shape that would immediately catch a cat’s eye and would strongly appeal to her. Cats love these type cave-like structure and would choose them over rest all. The mat inside has a layer of foam inside it. It provides with an additional cushion liner which makes it more comfortable for the cats and kitties to stay inside. This also makes it perfect for the aging cats suffering from the joint pain and thereby helping them relieve off the pain. Petmaker Igloo is one of the best available cats beds in the market. This is mainly due to the fact that it has a cave-like structure which is a factor that strongly appeals to the cats. Also, the fact that is pretty spacious from inside makes a room for your kitties to play cheerfully. The cushion pads ensure sound and deep sleep for your pet cat. Its tent-like structure provides the required security and privacy for the cats and kittens. And needless to mention, it provides the value for money. I would personally suggest that if your cat is one of those loving enclosed structures you can’t have a better option available than this. Paws & Pals is a big brand by OxGord. Paws & Pals is a big name in the field of pet supplies for more than 10 years and provides good quality products for cats and dogs of different sizes, shapes and also of breeds. OxGord Paws & Pals Tree House is a multi-level tree tower that is designed and shipped to the USA. It comes with a hammock bed that is so comfy. The tower of the tree house is pretty strong and is well made. Also, the scratch posts are very durable. Adding more to the feature, the hanging ball makes it a cute playful addition to Cat Bed. The bottom platform is so softer your kitty is gonna just love it. Just a thing to keep in mind is that OxGord Paws & Pals Tree House is not recommended for adult cats or for the cats of larger breeds. It is not meant to carry cats above 20 lbs. Larger or heavy cats won’t fit in properly in the hammock and would be a disturbance in their sleep thereby affecting their health. OxGord Paws & Pals Tree House is the best pick for the kittens and the cats who are lighter in weight. It comes with various fun and interactive toys that keep your kitties engaged and always keeps them entertained. It comes with multiple climbing and sitting platforms that makes is so useful. In my opinion, this is a for sure worth buying product for the new owners having little kitties. 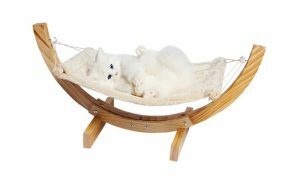 So, if you own a cute little kitty you can get this for her and she would love to curl herself dip into the hammock which would make her happy and feel satisfied. Looking for cute cat beds? Check out our review of Adorable Shark Cat Beds! 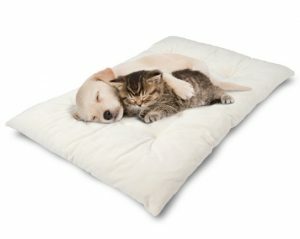 PetLuv The Premium Luxury Pet Pillow Bed is basically a double-sided comfy pillow your cat is gonna love to use. So, its time for your feline to change cozy soft her napping spot. PetLuv double-sided comfy pillow provides that warm and soft spot that will provide comfort to your cat as it will lay on it. It is made up of polyester material that makes its washing part an easy task. replacement for the crates and can be used as pads. It could fit inside any normal 20″ or 24″ crate. It would be much better than what the crates usually come up with. The pillow comes in a variety of two sizes that let the owners choose as per their requirement. Talking about variety, it comes in 4 different colors that match the carrier colors making it look perfect. This pillow is designed in such a way that it can be used anywhere feline loves to sleep. You can set it as per your requirement or as per the need of your cat. Pillow beds are mainly suitable for the cats who belong to larger breeds. They get to stretch out their body and feel relax. PetLuv The Premium Luxury Pet Pillow Bed is such kind of product that provides that comfy pillow for felines to stretch it out. Also, its use as a replacement is a great plus point for this Cat Bed. Moreover, it is priced not to be too expensive. So, if you are the owner of the feline that is too large in size and requires more space, this is the product for you. 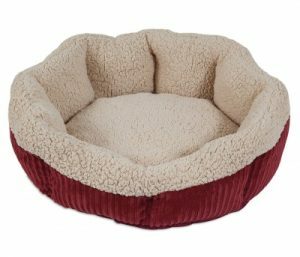 Evelots Soft Pet Bed for Cats, Assorted Colors is a warm and cozy cat bed that comes at an affordable price. It comes with raised sides that is comforting for the cats that have the basic instinct of nesting. It is an ultra soft bed that allows your cat to lay peacefully in it. At this price, I would say it is absolutely best! So, if you are facing issues regarding your budget just go for it. Evelots Soft Donut Cat Bed is an ultra soft pet bed that is perfect for your cat. It comes in the shape of a donut so is named after. It is made up of the plush polyester blend and both the bed and pillow are water resistant. The design of this is done so that it effectively traps the heat inside and keeps the pet warm. Along with it makes the pet comfortable while it is lounging. These types of beds are most suited for the pets that love nesting. In order to comfort the pet sleeping inside it has raised sides that trap the heat inside and makes it suitable for the pet to have a sound sleep. Also, it is available in wide range of colors to choose from. These colors make the bed attractive which makes it perfect for home decor. Evelots Soft Donut Pet Bed will surely complement your house no matter where you place it. Talking about the pricing, it is one of the cheapest cat bed available on the market. Unlike so many brands which provide beds at such a high rate, Evelots Soft Donut Cat Bed comes with a price you would find so affordable. Evelots Soft Donut Cat Bed is a budget bed with donut shape which helps the felines in supporting their head and spines. 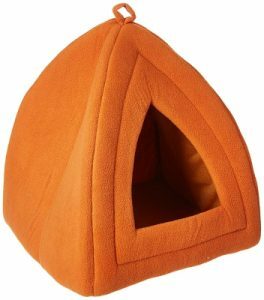 Also, its donut shape makes it warm and cozy, a place where your pet cat would want to spend all her day It is perfect for the cats who love to nest. It is a great product for the cats not too large in size and not too heavy. The less pricing of this bed is a boon for the pet owners as you may understand how expensive a decent bed for the pet can get. It is a good product if we judge it on an overall basis. If the size and other parameters suit your pet cat, you can surely opt for this product. Want some more house like cat beds? 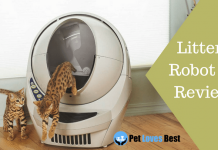 Check out our Best Cat House Reviews! 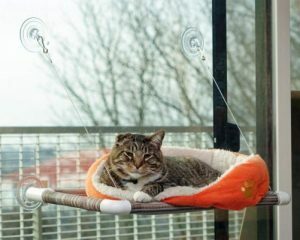 It is a great idea to have a perch attached to a window for a cat who could hours lying on the hammock being entertained by the bird feeder that is on the outside or some other places. The Original Kitty Cot is the best window mounted cat bed that is available in all market. The frame of the Kitty Cot is of plastic pipes that are very strong and durable. Your cats are gonna love the hammock that is made of soft but tough fabric which is made water resistant so as to ease the purpose of washing. It is a type of design your feline is gonna love laying on. You can mount Kitty Cot on any glass window or even on the mirror at any height. It attaches to the window with the help of large-size suction cups which are patented. One suction cup is made to hold weight up to 11 lbs, so Kitty Cot can easily hold a cat of 25 lbs. The design of Cat Bed is made so simple that it is so easy task so as to mount it to the window. Also, the installation of Kitty Cot requires no additional tools which makes it a pretty easy task so as to handle. Original Kitty Cot is a complete package you buy for your pet cat. Felines are going to just love this. Mounting it on glass windows keeps the cat entertained for hours to come. Cats love lying in the warm rays of the sun. So, they get to rest in the sunny place as they want or else they would enjoy the sceneries outside the window. Just the important thing to keep in mind is the set of instructions that have been provided. You need to follow the instructions the way they are given to follow. Don’t think. Just go for it! Loved the idea of window perch? Check out our Best Cat Window Perch Reviews! The founder of CatGeeks found a strong urge so as to connect deeply and in a better way with his cats. So, that is when CatGeeks was founded for millions of cat owners to help them connect more strongly with their pet cats. CatGeeks ComfyCat Cat Cave Bed is a soft, comfortable and warm bed that is handcrafted by using natural materials. It is beautifully handcrafted using only 3 natural ingredients by a process known as Wet Felting – Wool, Water & Soap. Mainly, it believes in fulfilling the 3 requirements of cats – Security, Warmth & Love for the Wool. It is made by a skillful craftsman who understands the need for quality products for cats. CatGeeks ComfyCat could easily fit in a 20 lbs cat inside and make feel comfortable. Also, the hole that is provided for the cat to enter is wide enough for her to get inside without any kind of trouble and also it remains firmly intact in its place. This amazing Cat Bed is made available in the color pattern that would fit in any room of the house – Grey/Aquamarine. Adding a star to the product, every CatGeeks ComfyCat comes with 6 months of warranty. So, it is a great feature that not many cat products come along with. Their primary priority is to take care of your cat’s happiness and also her comfort. CatGeeks ComfyCat is the best cave type Cat Bed that is available in the market. Cats love to sleep at a place that is mostly covered and this bed helps them fulfill the requirement completely. The bed is made so that it can keep your pet cats warm and comfortable inside. It is a versatile pet bed that can be used both inside and outside. It has a decent size opening given for the cat to enter, but it could be flattened and larger cats can also fit in. If you have a cat that loves to curl up in a cave-like covered bed, you should straight away consider opting this product without having any second thoughts in your mind. Check out our Best Crochet Cat Bed Reviews! How great is it when you get multiple products on purchase of one. Similarly, Bow Meow Premium is a 2 in 1 cat bed that features two types of pet beds in it. 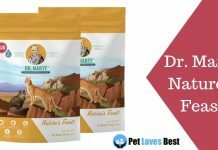 This product is made by pet lovers who are passionate about pets and want to make products that would help make their lives more comfortable. It is a bed that is will serve your pet for all seasons. It protects your cat from shivering cold in winters keeping her warm and cozy inside a sturdy cave. And can be converted to an open mat the can be used in summers for which your furball will be thankful to you. It is a 2 in 1 foldable pet cat bed that be used in two ways as per the requirement of the cat and according to the weather. In winters it can be made into a cave-like structure that’ll work as a hideout for your cats. This will protect the cat from the bitter cold that is outside and keep her warm inside the bed. It is important to make them feel warm during the cold days as it might cause problems for her or else it may cause problems for them. Secondly, in the summers it could be used just as a mat, all you have to do is flatten it into a mat along with a plush pillow that makes it comfortable enough for your pet to cuddle in. Your furry friend is just going to be thankful to you for providing such a type of bed that is so relaxing and comfortable. It is made of an ultra-soft material that keeps makes in comfortable from inside and the outside material stops the heat that is inside from getting out. This makes it warm inside the Cat Bed and makes the pet feel comfortable. Washing the bed is also an easy task to deal with. You can simply wash it with lukewarm water. Bow Meow Premium is an ultimate bed for your pet cat. Its main feature of 2 in 1 is the best thing this product comes with. Different cats have different requirements which are to be satisfied. This product does fulfill 2 wishes in 1. Also, the task to wash it is also pretty easy that requires no additional efforts. This Cat Bed is a bit expensive than the ones in the market which may be a case of issue for few of the owners. Rest it is a complete bed product you would want to get for your pet. If you are willing to spend money for the comfort of your pet it is the best product you could ask for. 4Claws is a team of pet enthusiasts that dedicated to designing products for their love towards felines. They have started with a basic scratcher series which comes with the simplest of designs. Furry Cat Bed is an easily convertible furry cat mat that can be easily folded into a bed. You can consider it in placing the mat on the bed or on the couch and encourage her to remain on that spot. This would surely make her spare the furniture that she is so fond of chewing. It is mainly designed for small pets that do not get into the category of heavy cats. Furry Cat Bed has been made out of a faux material that is ultra soft which makes it comfortable for the pets to lay on. The mat is designed in such simple steps that it allows to convert it in bed in no actual time. Also, an enclosure is created when the mat is converted to a bed from the folded rim. This enclosure appeals to the kitty that is inside to curl up in. this cat bed is machine washable that makes it pretty simple for the cat owners to clean them. So, this task of cleaning the beds is taken care of in simple steps. Also, its white furry skin looks to get along with the home decor, no matter what it seems to suit it. When laid flat it forms a mat that makes it comfortable for cats mainly in summers. 4Claws Furry Cat Bed comes with a convertible design that lets it convert into a bed from the mat. It is one of the most simple looking pet beds available for the cats. It provides that comfort to the pet when it is converted into a bed as it forms that enclosure which provides ease to the pet. You can consider placing the mat on beds or couches that would give it a complete look and make your cat feel comfy just laying on it. So, if you have a pet cat that would love to be in open rather than some cave-like structure, this the product you I would suggest you must opt for. Aspen Pets is a group of pet people who thrive to make the lives of other per owners easy by making quality products for our pets that would be helpful for them on daily basis. Space blankets use heat-reflective sheets that keep the heat loss from the body due to thermal heating in very fewer amounts. Aspen Self Warming Beds also use the same technology to make it convenient for the pets in cold region. 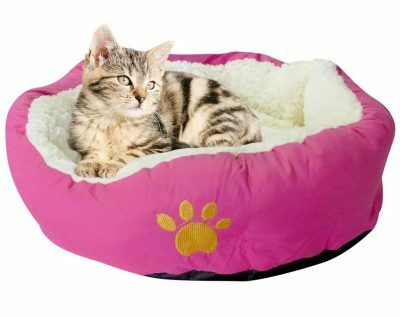 The material used in this Cat Bed generates warm heat that is released from the pet’s body and doesn’t let it leave outside the bed thereby keeping the temperature around the pet warm enough for the pet. As the name suggests, Aspen Self Warming Beds uses no source of electricity so as to generate the heat. So, it is a nice bed for the cats that live in colder areas. it ensures the safety of our pet cats as no electricity is being used. This cat bed is made up of plush wool and good quality fabric that keeps the pet comfortable. It comes with a non-skid bottom that prevents the bed from sliding away and makes it safe for the pets to use. It is of the size that can easily and comfortably fit in a cat weighing 11-25 lbs. Aspen Self Warming Beds provides a great feature of self-warming, which same as it is used in space blankets. Moreover, it does this heating without any cords or electricity which is a great feature to address. This Cat Bed is mainly required by the pets who stay in colder regions. It is suitable for cats of all sizes and belonging to all breeds. Also, it has raised sides which makes it more relaxing for the pets making them feel secure and keep them warm inside. These features make it one of the best cat beds available. 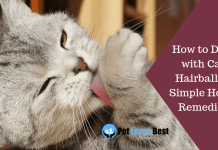 If you have a pet cat that loves to stay in the warm atmosphere then this is the product you would want to gift to her and make her feel comfortable enough. PetFusion Ultimate Cat Scratcher Lounge: For the product to be the best among the others, it must fulfill all requirements providing comfort at the most and should also fit into the budget. 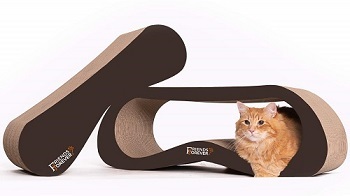 PetFusion Ultimate Cat Scratcher Lounge is not just a bed, it is scratcher, lounge and much more than that. It is a recycled cardboard product that comes with attractive design and variant colors. Overall, it is a complete product in all terms and performs its task pretty efficiently thereby making it my best pick for the cat beds. PetFusion is a company founded in order to fill in the world of pet products that they felt was missing – Designs, Quality, Affordability. Today PetFusion is a big name and has bagged many of the awards thereby contributing actively in taking this industry of pet products to a higher level. PetFusion Ultimate Cat Scratcher Lounge is the best available cat bed in the market according to view. It is not just a scratcher or a lounge it is much more than that. It is going to be loved by your feline friend and also by you, and I can’t forget to mention your couch which is also going to love it. Moreover, it is a super quality product that is recycled and made from eco-friendly materials thereby keeping in mind the safety of earth. It has minds involved in the design of this Cat Bed that makes the task of scratching for the cats so easy and relaxing. Its design makes it a comfortable place for the cats so as to play and take rest. Your felines would be so thankful to you for getting this as their bed. This bed comes in a variety of three neutral colors that is gonna make your cats too happy. Als0, this would prove to be a great product for you too as it won’t affect your budget that much. Yes, you heard it right! This is one of the most affordable priced product you’ll get on the market. It would 100% provide you the value for the price you are paying for it. Designed greatly to allow cats to stretch out. Quite an affordable cat bed. Some manufacturing defects have been spotted by the users. PetFusion Ultimate Cat Scratcher Lounge is a great product with amazing user feedback and happy cats. It has been amazingly designed and looks great in your modern house too. Besides its awesome looks, the bed is quite affordable and hence this cat bed from PetFusion is a Yes-Yes from our side! 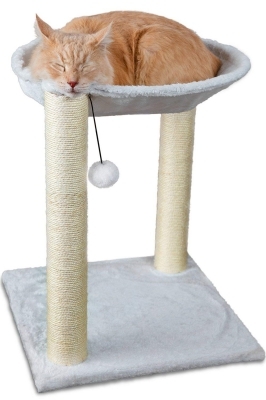 This cat scratcher comes with a superior design that prevents it from tipping. It helps keep your cat entertained thereby preventing her from scratching the furniture of your house. Moreover, it comes with a unique 2 in 1 design that could become a secret hideout for your cat to keep her different toys safe. So, if you are one of those cat owners who are willing to spend money for her without any restrictions, this is the product you would want to go for. So here’s our amazing buyer’s guide that will help you to choose the right cat bed for your feline. Do you own a kitten or a large sized cat? Take the size of your cat in the account and choose a cat bed accordingly. Even the sleeping style of your cat can affect the chosen bed. I.e if the cat sleeps stretching out, then you must go with a pet bed that does not have small boundaries and if the cat loves to sleep snuggling in a curled up position, a donut bed can be the right choice. Also, there are beds available in a cave-like shape, however, there is less number of cats that would love such a bed. Cat beds are also available in plenty of styles. For example, there are even cat beds that you can mount on your window to let your cat enjoy a mighty place of her own. Another great design is of a wooden mount without any cushions. This will allow you to make your modern home look more stylish and let the cat scratch up the place like cats always love to. And if your cat is calm and loves princess like comfort, choose a pillow-like bed. This will let her have a comfy sleep with a soft base. If you buy a cat bed that is all fabric, make sure it is machine washable. As there are a lot of products in the market that looks pretty neat when first bought but are not easily washable, hence, slowly turns into an ugly shape. And if you buy a bed that is free of fabrics, make sure it is easily cleaned. As you don’t want to end up buying something that turns into a mess and makes your home look and smell bad to your guests. Lastly, if you are investing in a product made of fabrics, make sure the fabrics are chemical free. A fabric not natural can spread chemical-like smell and can cause allergies to your fragile kitten. Also, if the cat does not like the smell or feel of such fabric, it may just refuse to use it ever again and you’ll end up with a worthless product, no matter how much big of an investment you’ve made. Below are some of the products based on your cat’s sleeping style. Choose one as your cat pleases. 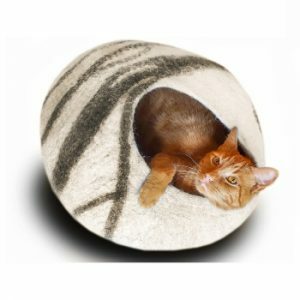 CatGeeks ComfyCat: For the cats that love sleeping in nesting, this cave type cat bed from CatGeeks can be your choice. This bed having an opening on the upper side of the bed covers your cat from all around. This gives the cat a warm and comfortable feeling and provides them with a sense of security. Moreover, washing this bed is an easy peasy task! PetLuv Luxury Pillow Cat Bed: Some cats like to sleep all snuggled up like a princess. For such cats, a pillow bed works just perfectly. Such a bed does not only provide them with a comfortable surface to sleep on but also lets them have a good night sleep. It is easy to maintain, comes at a cheap price and can even hold large cats. What else do you need! Evelots Soft Donut Pet Bed: The cats that love to lean on objects are often looking for a soft surface to get more sound sleep. The Evelots Donut Cat Bed does exactly the same. It’s surrounded walls let the cat lean wherever she wants to. In addition, it gives the cat a cozy and warm place that she’ll never want to leave. Below are some of the best beds based on whether you want to keep it indoors or outdoors. 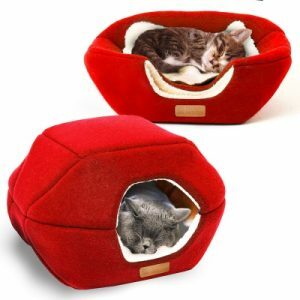 Bow Meow Premium Pet Bed/Cave: This stylish cave bed from Bow Meow comes with a foldable design. It is a convertible cat bed that can hold your isolation seeking cat in a cave and a fearless cat in an open bed. In addition, it is easy to clean and comes with a soft fabric that your cat will fall in love with. CatGeeks ComfyCat Cave: This cat bed is the same multifunctional as the one discussed above. But the exception is that this bed is made from 100% New Zealand Merino wool. And thus can be used outdoors as well. Handcrafted by the experts at CatGeeks, this bed has nothing to complain about. Here are more outdoor cat beds! Check out our Best Outdoor Cat House Reviews! Did you use the same bed since you were in a cradle till you grew up in an adult? No, right! That is exactly why you need to consider your kitten’s size when it comes to buying a bed. OxGord Paws & Pals Cat Tree House: This cat bed comes with a tree house like structure and is ideal for small lightweight cats or kittens. Made from wood it is covered with faux fleece. This bed features multiple platforms to climb and snooze. And of course, the fun toys make it amusing for cat of any age. Original KITTY COT “World’s BEST Cat Perch”: This premium bed can be mounted on the window of your apartment so that your cat can enjoy the outdoor view all the time. It is easy to install and completely dependable. You can use it both outdoors and indoors without hesitation and best of all, it will fill your cat with thrill. PetFusion Ultimate Cat Scratcher Lounge: Large cats need more space to sleep and tend to sprawl out as well, which is why This lounge from PetFusion is our Favorite! The amazingly designed cat bed will bring a modern look to your living room and its eco-friendly gentle material will make you cat fall in love with it. Based on the age of the cat, its requirement for comfort changes from time to time. Below are some beds best for the cats according to their age. OxGord Paws & Pals Cat Tree House: This cat tree house is made from eco-friendly materials and is covered with faux fleece. If you’ve got kittens, this will surely take care of them with its ultra soft surface. With a heightened structure, it will keep the kittens from messing around and occupy them with the fun toys included within. CatGeeks ComfyCat Cave: This cat bed is a paradise for any cat that loves to burrow because of the cave structure. But if your cat likes to sleep in an open environment, no worries, this bed will transform into an open bed in no time. Moreover, its Marino wool is handcrafted by the experts for a premium feel. Lastly, it can be used outdoors as well! Evelots Soft Donut Pet Bed: Grumpy old cats surely love everything that feels soft on their body. And that is exactly why this cat bed from Evelots is going to be your cat’s favorite! It is made from ultra-soft fabric that will support the head and spine of your old cat. And the donut-like design will keep her warm and cozy all the time! Here, we have presented you 10 of the best cat beds currently in the market. Choose the one that will please your cat. We hope that we have played our part well. If you have any queries, let us know. We will surely love to help you out. Till then keep on spreading Kitten-Love! Previous article25 Best Dog Instagram Accounts for Dog Lovers to Follow Right Now! Next articleDifferent Ways of How a Cat Shows Affection – Secret Kitty Language!